U.S. Secretary of State Hillary Clinton on Friday stood by South Africa’s much-criticized quiet diplomacy with neighboring Zimbabwe. 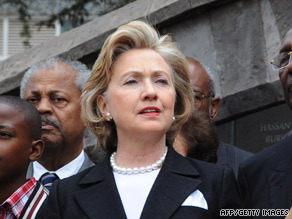 Clinton arrived Thursday night in South Africa from Nairobi, Kenya. The stop marks the second leg of a journey that will take her to seven African nations in 11 days.